A dream took flight with a snip of the scissors when Ken and Ruth Smith, known for their many creative projects, cut the ribbon (see front cover) to formally open Honeymoon Bay Lodge and Retreat June 21. 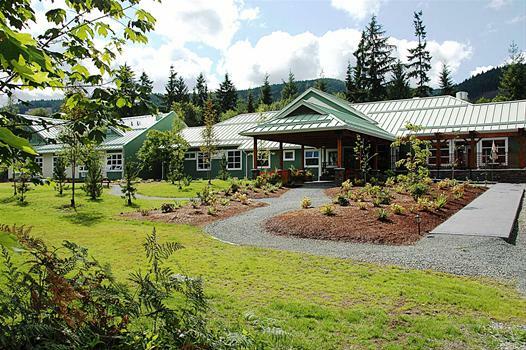 Located in the Cowichan Lake area, the lodge was created when a four-room school on three acres went on sale last year. In a remarkably short time, a talented team has transformed it into a stylish getaway for groups or individuals. The lodge features gourmet meals from the hands of professional chef A.J. Hicklin. He works with guests to provide special menus for weddings and other events. A nicely-designed lawn, garden and gazebo make this an attractive venue. While staying at the lodge, people may enjoy a hot tub – or a stroll through Aslan’s Garden, complete with a lion statue. There is a comfy library with internet access, an exercise room, a multi-purpose room, and a labyrinth to walk if you’re so inclined. You can even request a professional massage. Does this sound relaxing yet? Jim Robertson, with background in both business and counselling, serves as marketing manager, but is also available for anyone wanting to talk, receive counselling or request prayer. Ken Smith’s lifetime of supporting unique ministries lies behind this culminating effort. Through the Oswald Smith Foundation, created by his father, Ken and Ruth have quietly created and supported many unusual projects. In the 1970s, they saw a need for ‘Jesus people’ – often converted hippies – to be housed in a stable environment, with an opportunity for good teaching and role models. So Matthew’s House was opened in Vancouver. Then there was Mount Woodside, a mainland getaway for groups of up to 14. It is often booked for weekends for months in advance. Chemainus Theatre was born out of the Smiths’ vision to invest in the community, but also quietly to encourage Christians who wish to be involved in the arts. One project that simmered for many years was the Artisan’s Village in Chemainus. The original vision was to build a retreat centre as part of that effort. In 2004 Tim and Karla Erickson moved from Rosebud, Alberta – where he had been involved in the Rosebud School of the Arts and the Canadian Badlands Passion Play – anticipating that he would develop the Artisan Village. But rezoning difficulties slowed the project down. Before long, they received a phone call from realtor Stuart Price, the Smiths’ son-in-law, telling them an interesting property in Honeymoon Bay was available. Making God’s presence felt in a whole community has always been the guiding vision of the Smiths – and they are finishing strong, passing that torch to the next set of runners.